The Patriot Full Body Harness is the ultimate in comfort and versatility on the market. It can be used for basic rappelling, rescue and work applications, such as full body harness for climbing. Certified to NFPA 1983-2012 edition. ✔ The harness waist belt is constructed around an up to 8″ wide 0.25″ EVA poly suede foam padding for additional lumbar support and with extra padding at the hip postioning D-rings to ease the pressure points when sitting in the harness for extended periods of time. The foam is covered in a navy blue ripstop material to provide long lasting protection against wear. ✔ The double pull waist belt is adjusted with a pair of standard 2″ spring loaded buckles (one on each side) for ease of tightening and positioning on the hips and the spring loaded buckle helps to prevent slippage. It has four attachment points: front, back and two side positioning D-rings. ✔ The front and two positioning D-rings are large, 2.2″ inside diameter buckles to provide the ability for multiple attachments and the D-rings are bent at a 30 degree angle to facilitate carabiner placement. ✔ The back D-ring is a standard 2″ buckle which is used as the connection point for the chest harness and can also be used as a rear attachment point. There are three large plastic covered gear loops for hanging your extra tools and gear and two plastic webbing keepers for the extra webbing left after adjusting the belt. 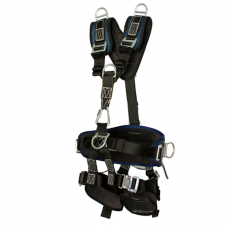 ✔ The chest harness features a standard 2″ D-Ring for the front attatchment point and the rear D-ring is a large, 2.2″ inside diameter buckle to provide the ability for multiple attachments and is bent at a 30 degree angle to facilitate large hook placement. ✔ It also has a pair of shoulder lifting D-Rings for vertical extractions. Dual adjusters on the front and one rear adjuster provide a wide range of adjustability for different heights of users. ✔ The chest harness connects to the standard 2″ buckle on the back of the waist belt and in front with a delta screw link (provided) to leave the front D-ring open for connections. Available in two versions: removable chest harness for fire/rescue applications and non-removable chest harness for work related applications. Weight 2.6 lbs. ​Small/Medium: Waist 26" - 46" - Leg Loops 22" - 31"